As Suenaga, Hagisako, and Okamura strive for the number one spot in the series, this round the winner emerged to be Hibino. Posting the second fastest entry speed during his solo run, Hibino managed to proceed up the ladder without making any mistakes. Semi finals, Hibino took out the prospected champion Hagisako and was matched up with Deura in the S14. Hibino charged in and was clearly holding his ground to his advantage until the 2nd turn but Deura showed his best technique at the tightest turn in the back. At the end, Hibino was crowned the winner. 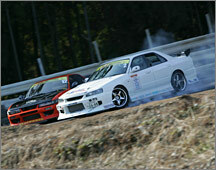 At the best 8 round, Hibino was matched up against Inose in the 1000 horsepower Toyota Aristo. Despite Inose's high horsepower, his vehicle moved sluggishly due to extra wheel spin. The fast and nimble Hibino followed his opponent very closely from the start, proving his worth. Hagisako proceeded up to the semi finals to battle Hibino. Hibino takes the huge advantage in the first run where he simultaneously starts his slide and tailgates his opponent aggressively. Hagisako couldn't move in on Hibino on the second run and displayed a slight understeer. Hibino wins this round. Suenaga vs Deura was a part of the best 8 match. There, Deura followed his opponent very closely and aggressively like he had nothing to lose. Although Suenaga's run was good, Deura's performance proved to be much better. This match changed the whole course of the championship tournament. The #2 ranked Hagisako was matched up against Ueo in the best 8 round. Ueo gains the advantage for the first run after following Hagisako very closely. However in the second run, Ueo suffers a blown engine, spinning out of control. After the best 8 matches have concluded, Su4naga's rank was determined, pushing Hagisako as the champion. "Everyone's support gave me the power. Thank you!" The "Emperor" Koguchi rises to the top. At the best 16 tournament Koguchi proceeded to defeat N. Suenaga, Hibino, and Hagisako to advance to the finals. Ueo had also won his way to the final match. Ueo follows Koguchi very closely on the first run, but too close for comfort and ends up spinning. 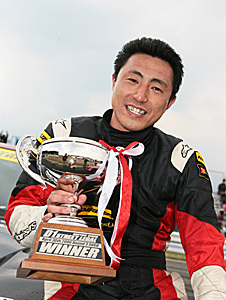 Koguchi had displayed perfection on the second run, and was given the much deserved win. 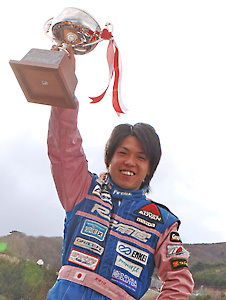 At the awards ceremony, the entire race track was in tears including Koguchi, all the contenders, and even Daijiro Inada. The championship continues with Suenaga, Hagisako, and Okamura within 6 points of each other, aiming for the season victory. Hagisako, ranked 3rd overall in the series was Koguchiís opponent for the semi finals. On the first run, Hagisako swerves back straight after witnessing Koguchiís overwhelming speed. 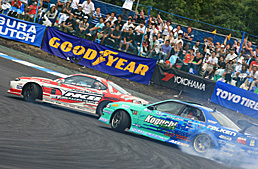 Koguchi receives the advantage at this point, and the win as well after keeping on his opponentís tail. At the best 8, Koguchi faced Hibino, who achieved a perfect score on the individual run round. 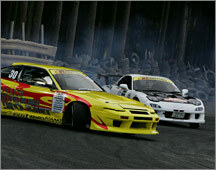 The heated battle continued to the sudden death round where Hibinoís drift swerves back straight while in lead. Koguchi ends up winning after displaying a more aggressive angle than Hibino at the end. The 1st and 2nd place ranked contenders, Okamura and M.Suenaga dukes it out at the best 8 match. When Okamura was in leading position, the match ends up with a tie. 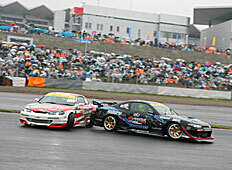 However when Okamura is in chasing position, he failed to slide the final corner, handing the win to Suenaga. 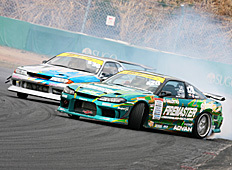 Daigo Saito in his Tourer is put up against Kamada in the FD3S at the best 16. He receives the advantage after the 1st run but swerves straight on the 2nd run after following too closely. This resulted in a T-bone collision with Kamada. "This time, Iím going to come home the winner!" The final battle consisted of Yashio Factoryís Okamura versus the Kagoshima native Hagisako. 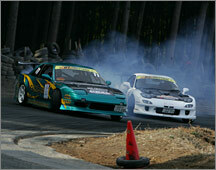 Both contenders displayed some exceedingly aggressive drifting followed by graceful tsuiso movements. The judges were unable to determine which was superior, pushing the two into three sudden death battles. The first battle, Hagisako spins and Okamura spins out on the next run. The two collide on the next match, crippling Okamuraís machine from moving on. For achieving a 10 to 0 on the first run, and having to retire on the second run for Okamura, the final battle ends in a tie. Hagisako was matched up against Hibino in the semi finals. Hibino was doing very well this day in his new S15, however on the second run, mechanical problems concerning his engine leads to his loss. Hagisako advances to the finals. Okamura battles GP Sportsís Komagata in the semi finals. Okamura followed very closely on the first run but had a few mistakes ending the run in a tie. Komagata jumped into the entry turn at great speed on the second run but ended up swerving straight. Okamura takes the win. Representing GP Sports, Komagata goes head to head with Masao Suenaga in the best 8 tournament. Both are tied after the first run, after a close tsuiso match. Suenaga makes contact with Komagata in the second run after following too closely. Komagata took the impact, but Suenaga ends up spinning instead. Komagata advances to the next round. This season, Daigo Saito has been appearing in a great number of tsuiso matches whether in D1, or the Street Legals. By leaving a sufficient gap between the AE86, he didnít have to adjust to Hibinoís sluggish machine. This enabled him to perform his own drifts. "I became absorbed in the pursuit to win so I pushed myself to the limit." Fukuyama had made it to the tsuiso round for the first time, but he didnít stop there. 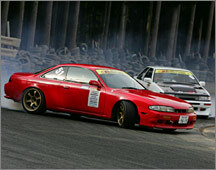 With a safe and effective driving style, he defeated the big timers such as Ueo and Ken Maeda. He was matched up against Fujino in the finals, with Fujino swerving back on the 1st run. 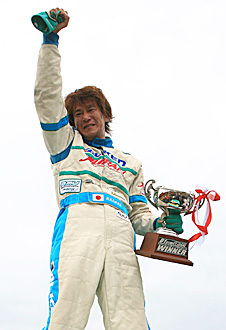 With Fukuyama gaining the advantage for the second run, he chased his opponent with perfection to achieve his first win. Fukuyama was paired up against Ken Maeda in the best 8. Although Maeken closed in on him on the first run, he had a single mistake, evening up the score. Maeken spun out on the second run to give the semi final advancement to Fukuyama. His semi finalist opponent was Ueo. Ueo gains the advantage on the first run. Fukuyama managed to close in on Ueo who understeers. Fukuyama advances to the finals. 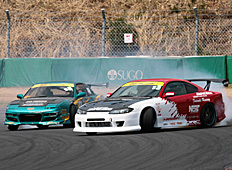 At the best 8 competition, the young guns Saito and Matsui battle it out. The first 2 runs, both parties end up spinning out and were given another opportunity. 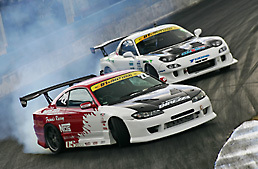 There, Saito spins out again, and the win was given to Matsui. The best 8 was Komagata vs. Ueo. Komagata spins out on both runs. On the second spin, Komagata started spinning at a high rate of speed, with Ueo barely avoiding a deadly crash. "It was a little risky, but I managed to win"
Inose gathered high points since the solo run round by showing amazing entry speed and great power. During the tsuiso rounds, his high velocity entry had left his opponents in the dust. 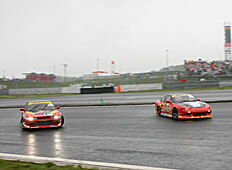 Proceeding to the sudden death finals, Deura displayed huge understeer securing Inoseís spot in the podium. Inose was put up against Hagisako in the quarter finals round. 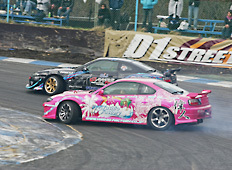 During their first run, Inose gets left behind by Hagisakoís speed but achieves the advantage after Hagisako swerved back his drift. Inose secured his advancement after making no mistakes in their second run. Yashio Factoryís Okachan was his semi final opponent. 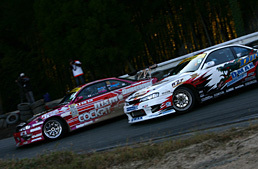 Although Inose messed up his entry while chasing, his speed and angle was much better than Okachan. One of the 4 best 8 match was Matsui vs. Honma. 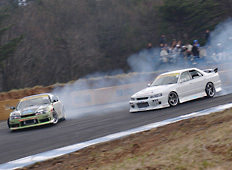 While in pursuit, Matsui pressured Honma by closely following his tail. Matsui made no mistakes when in lead. 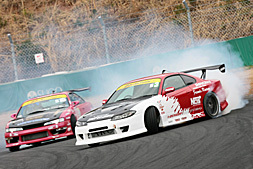 Daigo Saito showed unbelievable entry speed considering his heavyweight 4 door sedan. His extreme and angle and speed pushed his advancement to the best 8. "I've always wanted to go all out at the Ebisu Circuit with my own personal car." 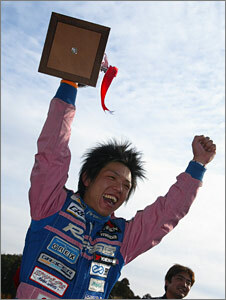 Driving a long way from Kagoshima to Ebisu Circuit where his brother Naoto works at, Masao Suenaga was on fire this day. His display of high speed and top notch machine control had carried him to the finals. 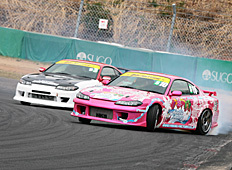 His final opponent was Inose, who came equipped to battle with a 600hp S15 Silvia powered by NOS + turbo. Those modifications left all of Inose's opponents playing a game of catch up. 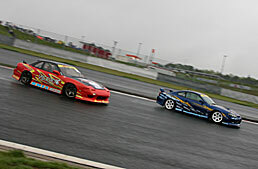 However, the throttle body failure led to his forfeit, handing the win to Suenaga. 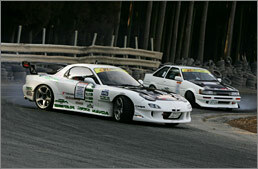 This was Suenaga's 2nd consecutive D1 Street Legal season opener victory. Suenaga's opponent in the best 16 round was Hiyane. Hiyane claimed that he needed more practice time after understeering during battle. Suenaga excelled at chasing Hiyane the entire time. At the quarter-final round, Suenaga was matched up against Hibino. Hibino could not keep up by chasing Suenaga's cornering speed on the first match. 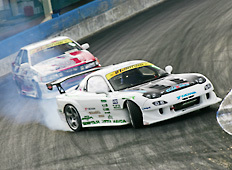 The second run Hibino exhibited his infamous 'Ebisu leap' but failed to win after swerving back during mid drift. 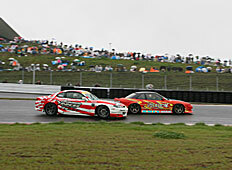 Yashio Factory's Oka-chan was put up against GP Sport's Komagata who swerved back when chasing Oka-chan. Because of this, Oka-chan was declared the winner of this battle. Following 3 consecutive 100 point solo runs, Nomuken understeers after following his opponent too closely at the quarter-finals. He could not proceed past the best 8. "I wanted to uplift the Street Legal division and take the win at the same time"
Battling Hagisako, who is also a Kyushu native, kept up with Suenaga using 400 hp and a dog geared transmission. After three sudden death overtime matches, the win was handed to Suenaga. 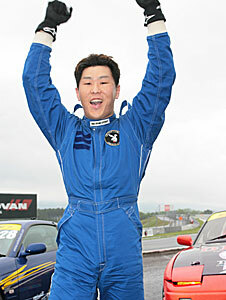 The 4th place finisher of last year's Autopolis round, Shinji Matsukawa's brother, Kazuya Matsukawa was Suenaga's opponent in the semi finals. Matsukawa was in heat at the time, but after dropping his rear tire into the dirt he became out of bounds. 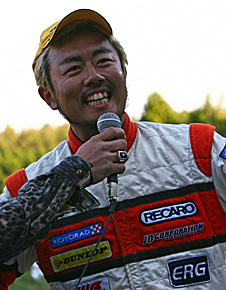 After scoring top points during the qualifying, Murakami advanced to the tsuiso round in his S14. During the semi finals, he exhibited great angle and speed at the 1st turn, but stalled at he 3rd turn from missing a shift. Hiyane advanced to the next stage due to his opponent's mistake. Nomuken ended up pushing his opponent after following too closely. Nomuken stated "I tried too hard. I thought he was going to take the outer line but, instead he came inside and I couldn't stop my car in time".